Tragedy struck in Belgium Monday morning as explosions shook the Brussels Airport and Maelbeek metro station, reportedly killing at least 34 people and injuring many more. 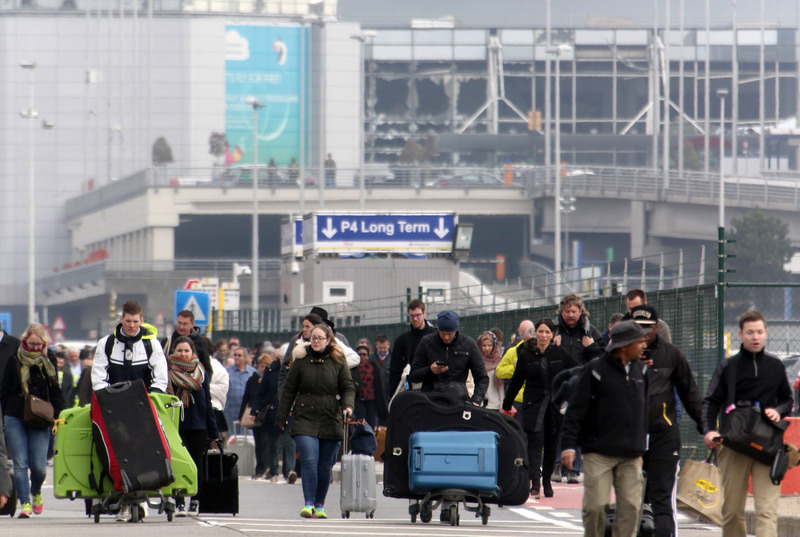 A distressing play-by-play has been taking place on various news outlets as details unfold, but an even more heartbreaking series of updates is taking place on Brussels Airport's own Twitter and Facebook. Monday's posts mark a stark contrast from the usual casual tone of the accounts, which normally sport the airport's trademark red heart logo as their profile photos. But there is nothing colorful about the accounts today, as the Brussels Airport logo has turned to black on both pages. The change is fitting, as Belgian Prime Minister Charles Michel called this a "black day" in a Monday press conference. The Prime Minister acknowledged the devastation of the attacks, but called for solidarity in the face of such adversity. And unity can certainly be seen on social media, with "Pray For Peace" trending as a hashtag on Twitter. Also trending is the phrase "Je Suis Bruxelles," which recalls the "Je Suis Charlie" hashtag that was posted worldwide after the Paris attacks last year. But amidst all the support pouring in from around the globe, the Brussels airport logo's grey hue recognizes that this is an undeniably somber day. The airport's social media pages normally post about goings-on in the airport, from formal security updates, to new dining options within the terminals, to playful pictures of airport employees. But today both accounts' feeds are filled with news of the explosions, as well as instructions for people trying to get ahold of loved ones who were at the airport Monday morning. The first post came at 8:41 a.m. local time, stating the announcement of the explosions and the airport's initial evacuation. The tweets have since continued regularly for the past several hours, with similar Facebook posts to match. Looking at the airport's feeds today is shocking and intense, but one must also acknowledge the power of the digital age in that the Brussels airport has been able to utilize social media to communicate important messages during a crisis. And perhaps the most important message of all is the one that is pinned to the top of the airport's Twitter page, expressing condolences to all those who were affected.